Anyone walking by TD Garden last night would've thought Jayson Tatum just dunked on Lebron James again with the thunderous cheer Boston Celtics faithful let out yesterday during a special event for season ticket holders. In case you've been off social media and somehow don't know, Celtics star Kyrie Irving told fans yesterday, "if you'll have me back, I plan on re-signing." Allow me a moment to pop another bottle of champagne, pouring some out for New York Knicks fans. Speaking of which, other fanbases -- along with some negative Celtics fans -- will undoubtedly latch onto the word "plan," as if his words weren't definitive enough. I can see that. However, any reasonable person must ask: why would Kyrie, a private man, profess his love for the team, the city, the organization, etc. in front of tens of thousands if he wasn't for real? More importantly, for legal reasons, and to avoid any tampering rules, Kyrie isn't going to divulge that he's definitely doing anything. Kyrie told teammates, front office, and ownership in recent days he planned to re-sign but no one knew if he’d publicly declare it. Some people questioned the lack of emotion displayed by Gordon Hayward and Al Horford, both of which were seated at mid-court with Kyrie when he stood up and made the announcement. Come to find out why. 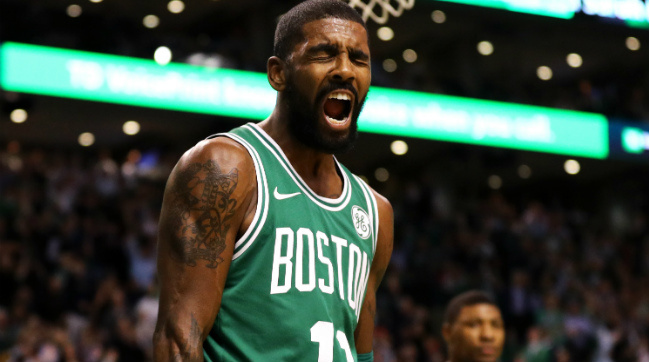 Kyrie Irving invited a small group of teammates to his house Wednesday to tell them he was going to re-sign in Boston. Playing devil's advocate for a second, I can see why some people are still holding off on purchasing their #11 jerseys. What if Kyrie gets hurt, like Isaiah Thomas, bring cause for pause to Danny? Would the max contract be pulled off the table? Would that make Kyrie think twice? I guess anything's possible. However, one must remember how calculated Kyrie is. He's methodical, analytical, and highly-intelligent. He knows what he has and what he's doing. He also (one can safely assume) probably has a wink-wink nod that the big bucks are on their way. But Kyrie won't talk contracts, not yet, and not to the media anyway. As well he shouldn't for obvious reasons. Following the announcement, Kyrie spoke to that notion. He also took the time to continue to fawn over the Celtics organization; not only for what he has with the team, but to thank them for taking a chance on him, knowing that he would soon be a free agent. He also wanted to thank the Celtics for helping him pack his bags out of Ohio. While Kyrie's "...getting me out of Cleveland" was humorous, in my opinion, a more important part of what Kyrie said was that that the mere thought of starting over was a "s----- thought." Makes sense. Packing up, starting over, learning a new team's schemes, trying to build camaraderie with new guys, having to adjust to a new coach, having to deal with clueless ownership. If you're going to do that, it sure as hell better be worth it. You don't go through all that unless you're leaving for greener pastures. Well, as Kyrie proved during his time in Cleveland that, with the exception of winning a title, the grass is definitely greener on the other side. The Celtics side. It's also packed with four-leafed clovers -- Irving being one of them.